It was a historical event, when Brazil, Russia, India, China and South Africa formed their economic Bloc named BRICS to counter traditional western supremacy. 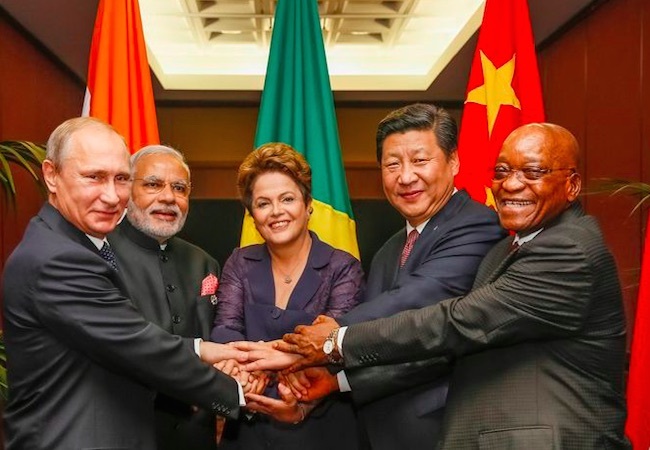 BRICS is a heterogeneous in nature. An iconoclastic economic order which considered by some economists and scholars as: a more democratic and just multi-polar world order. Currently multi-polarity is emerging as a new world order due to the growing influence of state and non-state actors at national, regional and international level. Actor at the world stage, these are European Union (E.U), NGO and non-state actors. The prominent thing is that, multi-polarity will shape the destiny of 21stcentury. If one reviews the literature of economies of Asia and Europe from last 2000 years, one will get to know that Asia will always rule the world economy to some extent. The findings of a survey conducted in 2001, reveals that the BRICS economies would incorporate 10% of world GDP. Moreover, it is stated that BRICS countries overcome the GDP of the Group of Seven countries (G-7) by 2035. Therefore, West is viewing BRICS as a competitor for its status-quo. The yardstick on which west is gauge BRICS as a threat is composed of both power factors; Hard Power and Soft power. Now question arises here is that what role it will play to influence or shape the regional and global politics. Its future role is dependent upon its cohesion and collective decision-making capability. The Neo-liberal school of thought, which is the main vision underlying BRICS clashes with the Western liberalist thoughts. BRICS can be considered as a product of globalization. The BRICS bloc, folded into two layers: one is economic and the other one is strategic. It is evident that after 9/11, the four countries; Brazil, India, China, and Russia are emerging in terms of economy and military and their growth rate surpassed the G-7 countries (United Kingdom, France, Germany, Italy, Japan, USA, Canada). On the other hand western countries had gone through enough disadvantage in terms of economy and military during different wars i.e. Iraq war, Afghan War, War on Terror (WoT). National interests are the fundamental factor which enforce states to cooperate with each other. Likewise, BRICS has a critical role in bringing member states closer to each other to get their mutual interests. China, India and Russia which are key members of this forums, can get economic and military impetus through these kind of forums. China and Russia consider it important against mutual rivalry with US. Moreover, Brazil is an important global player, playing its economic and political cards very cleverly; neither accepts Chinese hegemony nor rejecting it. On the other hand, it adapts a diplomatic and neutral posture towards various burning issues i.e. Syrian crisis to avoid enmity of US and Russia. The member states of BRICS are now widening its area of cooperation on other forums i.e. Shanghai Cooperation Organization (SCO). According to Francis Fukuyama, history died after Cold War (CW), it should be kept in mind that U.S. and China on global scale are arch-rival. US views China as a threat to its regional and global hegemon. Chinese activism in Latin America and emergence of Brazil as a regional power express US apprehensions. Firstly, we have to see what power is, which ultimately defined structure of hegemony: military power, economic power, and institutional power. Yet, in military power, still U.S. undoubtedly a military power in globe as well as in region terms. According to SIPRI, U.S. military expenditure accounted for about $ 700 billion in 2010, which made up 42 of the world share. China’s military build-up aircraft carrier has been in the debate in U.S. foreign policy order. Plan also held joint counter terrorism exercises with Brazil and humanitarian exercise with Peru. China’s military scale to Latin America is about 90% of China’s weapons. China is co-operating with Brazil in satellite technology, these are the signs to challenge U.S. military hegemony in Latin America. In the field of economy, the U.S. tries to strengthen its position throughout the last decades through the last co-operation and trade. China’s growing relationship with Latin America reveals China’s search for global power to establish a multipolar world. The increasing economic interdependence between Latin America and China, particularly the increasing dependency of certain Latin America and countries on China’s market represents the dominant dimension of Chinese power in the region. China peruses track II diplomacy, for its policy to peruse institutional power in Latin America. There are so many events in the history, but when we look back to recent history, first, 2001 represent the end of unipolar setup and the rising of multipolar system. To begin with, the terrorist attacks at World Trade Center, America that event known as 9/11, this event intensely shocked the world nation that saw itself as revealed and unprocurable to the world and its elements of vulnerability. Second, in 2001 November China agreed to the world trade organization (WTO), observing the entry of the greatest Asian economy in the world economic setup, although, and economic importance towards Asia has started, but still Atlantic basin is economically dominant. Third, it is 2001 that it is considered as Asian century. Fourth, the BRIC idea was instituted that same year by Goldman Sachs expert James O’Neill with a specific end goal to support interest in uprising economies. BRICS presents a challenge for America policy makers, first, to develop a coherent U.S. response to multi-polarity second, the rise of BRICS re-structure the policy debate from China vs U.S. competition to multi- lateral processes of institutional reform. U.S. government, especially Obama administration feel pressure to develop a response to BRICS. In the 20th century, 1991 was a year herald for unipolar order, yet in 21st century 9/11 changed the course and 2008 melt down stated that there is a time to acknowledged multi-polar world order. The story traced back to the recent past, the year 2001 symbolizes the definite end of the American unipolar moment. World economies are increasingly interdependent, this happens frequently due to charisma of globalization. To be more exact, the structure of the world is extremely complex because all actors inevitably intertwined in multiple layers of the system. Today, with presence of new actors, new world stage like BRICS, EU, and non-state actors; remains the unique global power. The vital ingredient would be BRICS bank initiatively this bank is an active tool to improve global economic governance. More centralized states are able to sustain the challenges of globalization than more pluralistic states. autocracy in confusions China , Russia, and Persian gulf, theocracy in middle east, tyranny in Africa, popular leadership in Latin America. These all regimes are challenging the notion of Western Liberalism, endangered, concepts of sovereignty, justice, freedom and freedom from exploitation. How BRICS challenges unilateral American hegemon, because this bloc aspiring to become regional led global hegemony as their resources rise. The BRICS if goes along with justice peace and opportunity to all; certainly it will become potent, legitimate and just economic actor in fragile, injustice and exploitive prevailing economic order.